Hi all! This is Alyssa. I'm another newbie here for the iCopic Design Team. As the others have said before me, I'm super excited to be starting off the new year with this fabulously talented group of ladies! 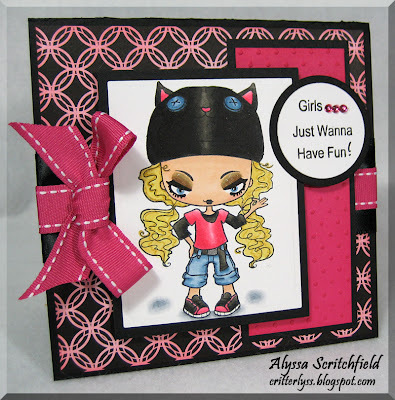 Today I'm here to show you a fun little card I made using The Greeting Farm's Creeper Crew - Thursday stamp. When I saw this stamp, I just had to have her! She's so stinkin' cute and sassy! One thing I'm working on this year with my coloring is to play with light sources. Figuring out where your light source is will help you decide where to add shadows and shading. For this example, I chose to have the light source coming from straight above. 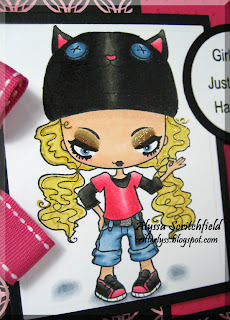 The highlighting is left on the ear tips of her hat and down the center of her hat and shirt. Another thing that will help to *ground* your image is to add a shadow beneath the image. Thursday has a distinct shadow directly beneath her and also beneath her pigtails. 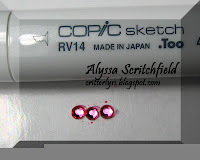 This is accomplished using cool gray Copics - C1, C3 and C5. Start with the C5 right next to the image, blend out slightly with C3 and then blend more with C1. As the ink dries on the paper, you'll get a nice gradient. If it's not completely to your liking, color over the shadow with the Colorless Blender. This will soften the lines and make it seem a bit more realistic. For the shadows beneath her pigtails, I drew small circles with each of the C colors in the same order. Since Thursday is so very sassy, she needed a bit of sparkle! For her hair, I used Y11, Y21 & Y32. After laying down some flat color, I squiggled some lines with a gold Spica pen from the A set. Her belt buckle is colored with the silver Spica pen from the same set. When I stamped her, I didn't get the best impression on her eyes. To fix this, I used a multiliner to draw her eyes back in all along the lashes, liner and pupil. Since the multiliner is a Copic product as well, you can color directly over it without any bleeding. I gave her some blue eyes and then dotted the pupils with a white gel pen. Once my card was all assembled, I realized that the sentiment needed a bit more punch! I tried a technique I've used in the past that was this weeks Tuesday Tips & Tricks. 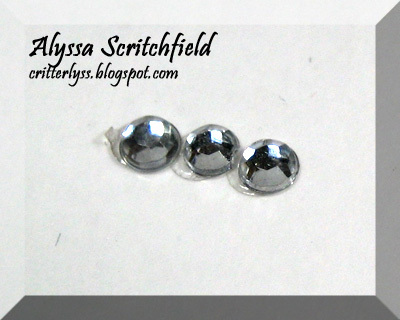 These clear rhinestones needed to be jazzed up a bit and bring that pink to the sentiment circle. All I did was color over them with the RV14 Copic (available soon in the Ciao!). I've found that I get a better color saturation if I dot the color onto the embellishment rather than try to swipe it on. I also give it a little drying time and give extra coats as needed. Awesome card! I love how you gave her eye shadow! And your coloring is outstanding! Great tip about the bling...Have a great weekend. Cute cute cute!! The shadows under the hair look great!